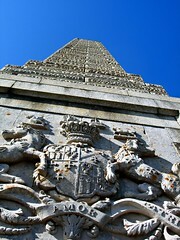 The Yarborough Monument on the hills of Culver Down looks out over the channel like a burnt out lighthouse. It is a memorial for Charles Anderson-Pelham, who became the first Earl of Yarborough in 1794 and founded the Royal Yacht Squadron. Lord Yarborough had what appears to have been an illustrious naval career but in 1846 he died at sea. The Bembridge.com site rather bizarrely comments that this was “…a sad occurrence as he was unaccompanied by any of his family.” The Royal Yacht Squadron funded the monument. I’d love more information about Charles Anderson-Pelham or the site of the monument, if any readers would care to point me in the right direction.